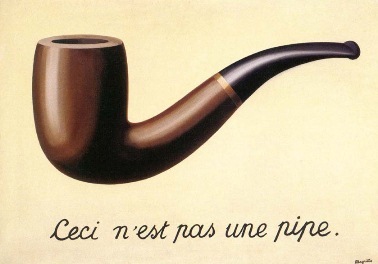 Image from wikipedia: René Magritte's famous painting, subtitled "This is not a pipe"
Lewis Carroll, in Sylvie and Bruno Concluded (1893), made the point humorously with his description of a fictional map that had "the scale of a mile to the mile." A character notes some practical difficulties with such a map and states that "we now use the country itself, as its own map, and I assure you it does nearly as well." In a sort of counterpoint to Lewis Carroll, the University of Cambridge economist Joan Robinson (1962) emphasized the disutility of 1:1 maps and other overly detailed models: "A model which took account of all the variegation of reality would be of no more use than a map at the scale of one to one." Last blog, in "What's South of the South Pole? ", we discussed the difficulty of envisioning things that are not part of the system we are within. With "the map and the territory", we have a way of thinking about how any representation of the system we are within is more useful if it finds ways to distill the elements, to avoid the uselessness of a map drawn to a scale of 1 to 1. In science, a physical picture is often more important than the mathematics used to describe it. As we've said before, in recent entries like Logic vs. Intuition, Computers and Consciousness, Do Shamans See Other Dimensions?, and Our Non-Local Universe: with Imagining the Tenth Dimension, we are using intuition to hold concepts in our mind that by all rights are really much too large to fit. Using Alfred Korzybski's analogy, we can say that's because this project is looking at an abstract representation: and looking at a map can be much more productive than looking at this unfathomably large territory that we're exploring. The story elaborates on a conceit in Lewis Carroll's Sylvie and Bruno Concluded: a fictional map that had "the scale of a mile to the mile." One of Carroll's characters notes some practical difficulties with this map and states that "we now use the country itself, as its own map, and I assure you it does nearly as well." The Borges story, credited falsely as a quotation from "Suarez Miranda, Viajes de varones prudentes, Libro IV, Cap. XLV, Lerida, 1658", imagines an empire where the science of cartography becomes so exact that only a map on the same scale as the empire itself will suffice. "[S]ucceeding Generations… came to judge a map of such Magnitude cumbersome... In the western Deserts, tattered Fragments of the Map are still to be found, Sheltering an occasional Beast or beggar..."